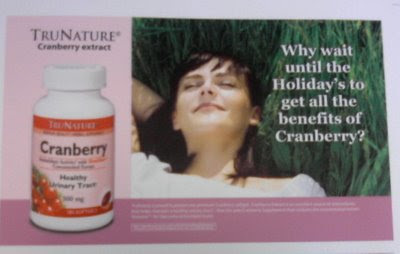 *cringe* I'd rather drink my cranberries anyway. How does that get past the editor/proofreader at the ad agency? Maybe the extract company did it themselves "in house." Like a colleague of mine used to say: "In-house creative produces outhouse results." Cinematically referencing, I'll have what she's having. Not only are they punctuation challenged, check out their website trunature.net, where they use the dreaded Comic Sans font.